Two new Deputy Vice-Chancellors have emerged for the University of Agriculture, Abeokuta. Senate of the University, at a Special Meeting, last Thursday, September 15, 2011, elected the two Deputy Vice-Chancellors for the University. The Deputy Vice-Chancellors–elect are Professor Toyin Ayodele Arowolo (Academic) and Professor Felix Kolawole Salako (Development). Professor Arowolo, 60, is the immediate past Dean, College of Environmental Resources and Management (COLERM). Professor Arowolo is a member of several academic and professional bodies, such as the Chemical Society of Nigeria. He has over 47 publications to his credit, both local and international journals and has attended several international training and conferences, including Management of Higher Education Institutions, in Israel. 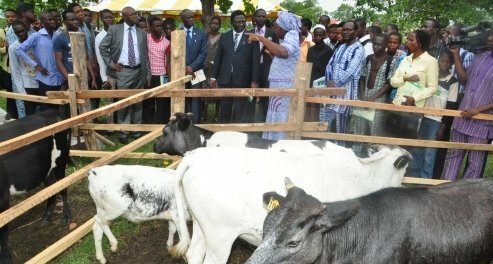 Professor Felix Kolawole Salako, 50, is currently the University’s Director, Community-Based Farming Scheme (COBFAS). He joined the services of the University on July 18, 2000, as Senior Lecturer and later became Reader in Soil Physics, on October 1, 2003. Professor Salako belongs to several learned and professional associations, including the Soil Science Society of Nigeria and has over 60 publications, with 46 in international journals. He has also been associated with the International Centre for Theoretical Physics, Trieste, Italy, through the Associateship Scheme and Training Programs. They are both married and blessed with children. Meanwhile, the elections of the Deputy Vice-Chancellors-elect, is expected to be approved at the 68th Statutory Meeting of the Governing Council of the University, later this week.